Sarasota Massage - Mending Hands - Melissa Finley - SRQ 34239: Is This You?!? Is your handbag going to give you arthritis? Not to mention slipped discs and bad knees? How lugging around a heavy load can put years on your body! Studies show half of women suffer pain from carrying heavy handbags — and now men are also suffering, according to new research by the British Chiropractic Association. ‘Heavy man-bags — weighing, on average, 6.2kg — put unbalanced strain and stress on the body, which can lead to pain, poor posture and health problems,’ says Rishi Loatey, of the British Chiropractic Association. ‘I’ve noticed a spike in patients experiencing pain in the neck and upper back due to carrying around heavy loads more frequently,’ he adds. There, my movements while walking were recorded and analysed — both with and without my weighty 9lb-plus handbag — to see the effects. The results were startling. 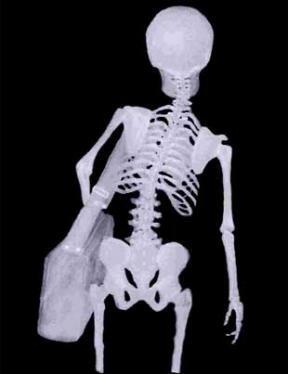 When you carry a bag, your neck naturally leans away from the load to help carry and balance the weight. This causes tension on the carrying side of the neck and compression on the opposite side. ‘Craning your neck means increasing the distance between the neck and the shoulder,’ says Russell. The problem is that this is just where a bundle of nerves come together (forming the brachial plexus) before running into the arm; the strain can lead to neck pain and muscle inflammation. Over time, this could trigger an ‘acute episode’, he says — the muscles can spasm, restricting movement and causing pain. The shoulder bearing the load is rotated backwards and raised all the time, explains Russell. This affects the muscles running down the upper back, the shoulder blades and those supporting the spine — they tire and spasm. Long term, this can lead to painful arthritis in the facet joints. These are tiny joints running all the way along the spine on either side The vertebrae and the discs — the ‘cushions’ of cartilage that sit between the vertebrae — could also be affected. "The side of the body not carrying the bag leans away from it, crunching the lower back on this side, while extending it further on the other,’ adds Russell. This compresses the vertebrae, wearing them down. Carrying a heavy bag can, over time, also cause disc degeneration and prolapse, says Dr Creaney. This is when the soft tissue inside the disc ruptures out of it, pressing on the nerves. ‘This can be agonising, and even require surgery’ he explains — ‘and carrying a heavy bag could lead to faster disc degeneration. The arm carrying the bag remains very static while walking to keep the load still and balanced. ‘This is quite different to the natural swinging movement we make when walking,’ says Russell. The nerves in the arms can also become irritated by the pressure of the bag, leading to chronic pain. In the long term, women can develop arthritis from increased pressure. ‘Carrying a bag makes you walk differently, and that changes the way forces act through the skeletal system, which could cause problems and pain,’ says Russell. The greater the load of the bag, the more pressure on the leg joints. Over a long period, force on the knees can cause wear and tear and joint problems. ‘With a heavy bag you also take shorter steps — an adaptation your body probably makes to control the load better and remain upright,’ he adds. Seen on ANATOMY IN MOTION! Taking a Break To Rejuvenate!